Last week we commemorated Yom HaShoah, Holocaust Remembrance Day. We remember the 6 million Jews that were murdered by the Nazis, 1.5 million of those being children, simply because they were Jewish. Today we commemorate Yom HaZikaron, The Day of Remembrance - remembering the thousands who fell defending the State of Israel and those who were murdered in terrorist attacks, simply because they were Jewish. The day immediately following Yom HaZikaron is Yom Ha'atzmaut, Israel Independence Day. A day of celebration - but one that has been tempered by the previous one, and Holocaust Remembrance Day the week before. We Jews have a long memory. During the summertime, there is the fast day of Tisha B'av, the day that brings to mind the destruction of both Holy Temples in Jerusalem as well as the many tragedies over the past 3000 years that we have survived only by holding tight to our faith in G-d. This faith in G-d is what has sustained us over the thousands of years since it was certainly not faith in mankind. Every country that we were loyal citizens of forcibly exiled us, leaving us to wander the face of the earth. The Holocaust, with the destruction of a third of the Jewish People, was the final proof that the world is uninterested (at best) in the security and safety of our people. Even the United States, turned it's back on those refugees trying to enter, forcing them back to Germany, back to their certain deaths. Because of those events, Jews no longer expect or even hope for world "interest". In fact, considering the anti-Jewish/anti-Israel sentiment at the United Nations, we would prefer "disinterest" on their part. Many cannot understand the Jewish "hang-up" about the Holocaust, why is it not better to forgive and forget. It is clear that their trust has not been shaken by false promises and generations of loyalty shoved back in their faces. The State of Israel is our safe haven. We no longer have to trust that the world has Jewish interests at heart - when we know they don't. It hurts to think that there was no one on the world stage who stepped up to save those 6 million Jews, and that there wasn't a Jewish state that those Jews could flee to. But it's different now. 64 years later we celebrate and thank G-d for our homeland. We can take care of ourselves - to be a free people in our Land, The Land of Israel. 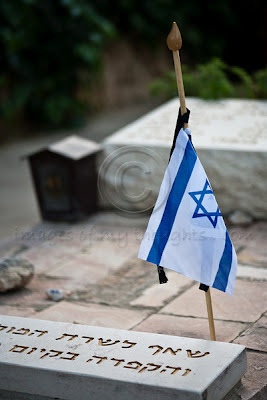 Yom Ha'atzmaut, Israel Independence Day, is a day that every Jew has paid dearly for in blood. We know that, unfortunately, when push comes to shove, there is nobody out there who "has our back". Talk is cheap. Jewish blood shouldn't be.